My dear brother finally had a reception. Their cake was lovely, not to mention delicious. I got to hang out with all three of my brothers. Ha. They really are fun people. My internet has been acting up so I do not know how much I'll be able to post this week...We'll see. I quite love this old bow that I found. I'm beginning to have a passion for off-white. It's such a calm, soothing color. I love this red skirt-It has pockets! I didn't get around to taking pictures until a couple minutes ago...that's why it's lame. I did some editing to make it look more interesting. I can't believe the weekend's already over! Monday is TOMORROW!? 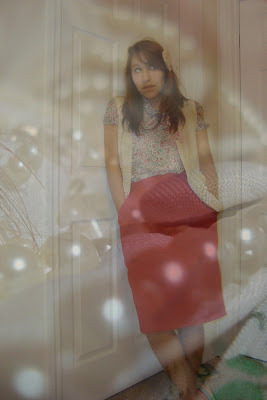 My mom found this pearly vest yesterday at a garage sale for fifty cents! I immediately adopted it as my own...She informs me that it's HERS though. Ha, I'll buy it off of her for a couple quarters... =) I hope your Monday is as nice as a Monday can be, loves. Oh Mondays... *sigh of exasperation* Here we go again.